This small but atmospheric square in the heart of San Bernardo is a great place to start the evening with an aperitivo or finish with an ice cream. It’s only ‘due passi’ (two steps i.e. 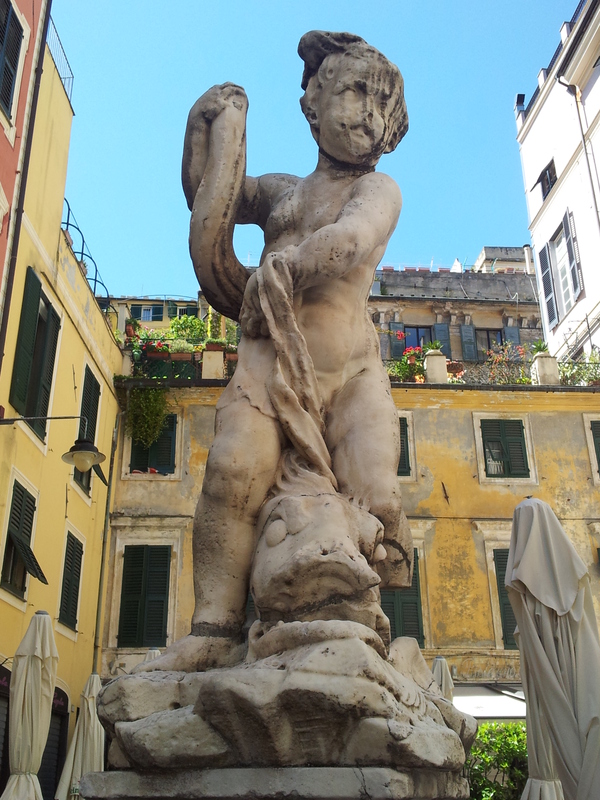 a short walk) from Piazza Ferrari. On weekend nights it’s standing room only in the square and streets around as the city’s youth come to let down their hair. I preferred to drink in the quieter Bar Mandragola (see San Bernardo post) on these nights but this is where the action is if you’re looking for it. My activities were a bit more sedate however. My favourite of the 3 or 4 bars in the square as the staff are friendly and they do a mean Spritz with Campari (€6). Stuzzichini (nibbles) are included as standard. The poshest place in this otherwise down-to-earth piazza, recommended by some guide (Cadogan I think). It’s been around since 1790 but this experience doesn’t seem to have been passed on to the very young staff (nice but dim). 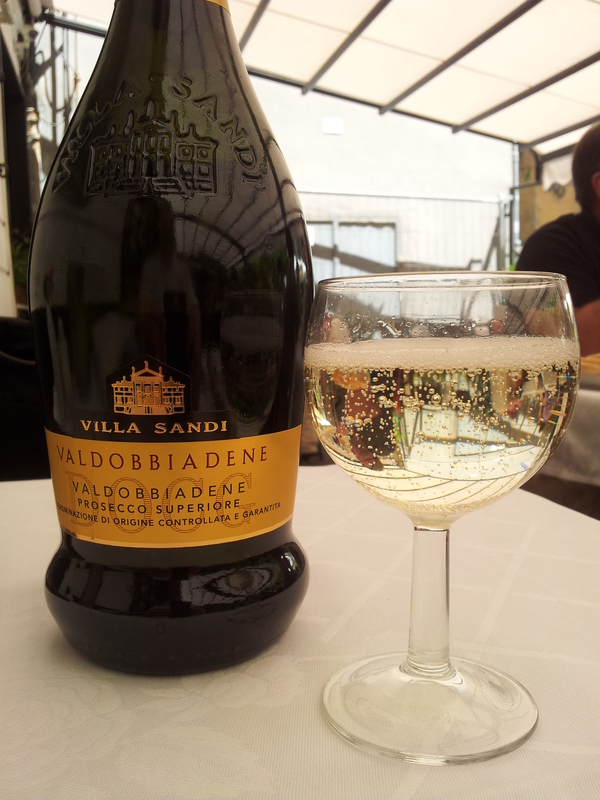 I decided to try it for lunch on a sleepy Sunday in the company of a bottle of prosecco (A) from the Valdobbiadene DOCG (Villa Sandi) under the awnings of the shaded terrace. 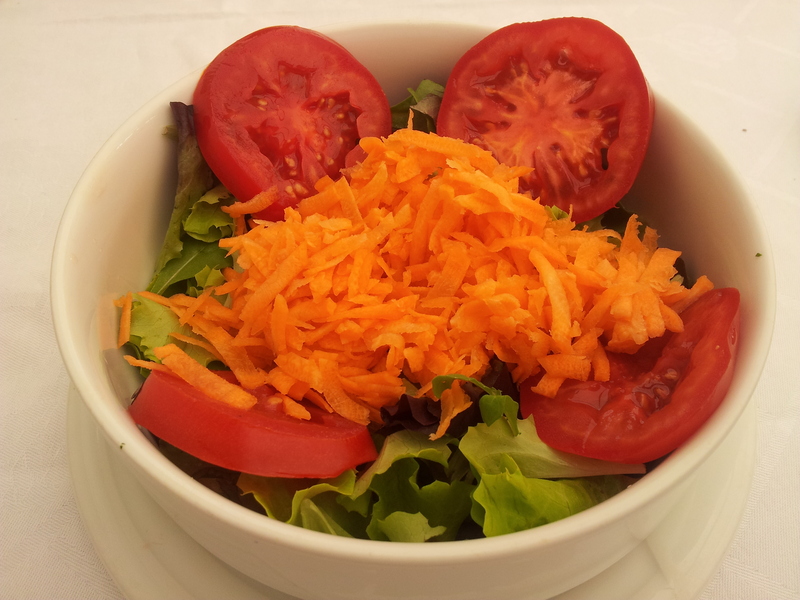 I had a simple mixed salad to start (A). The colours were so vibrant I just had to take a photo of it though! 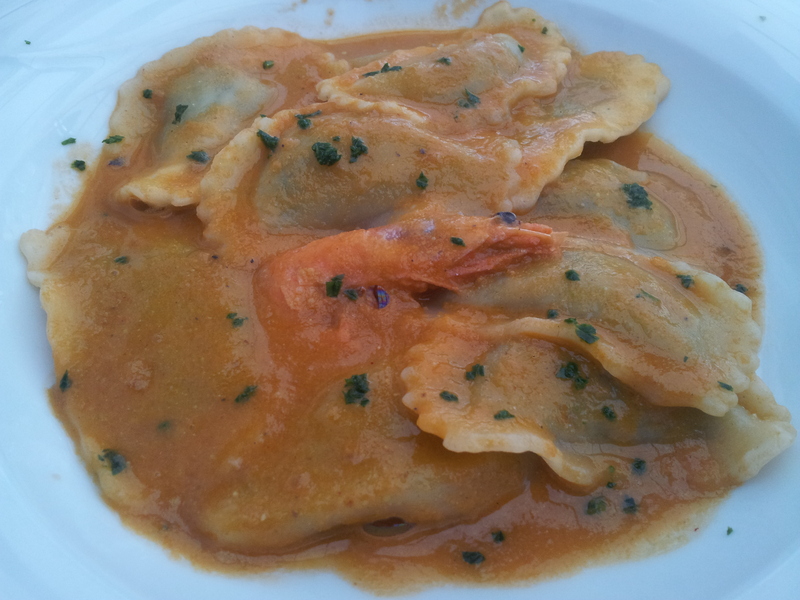 Next a pasta course of shrimp filled ravioli in a delicious sauce no doubt made from a stock using the shells of the shrimp (A). Total cost €31, half of which was the wine. I enjoyed it all and would go again. Considered by many to be the best gelateria in the city, this is where I liked to have my dessert after eating elsewhere. 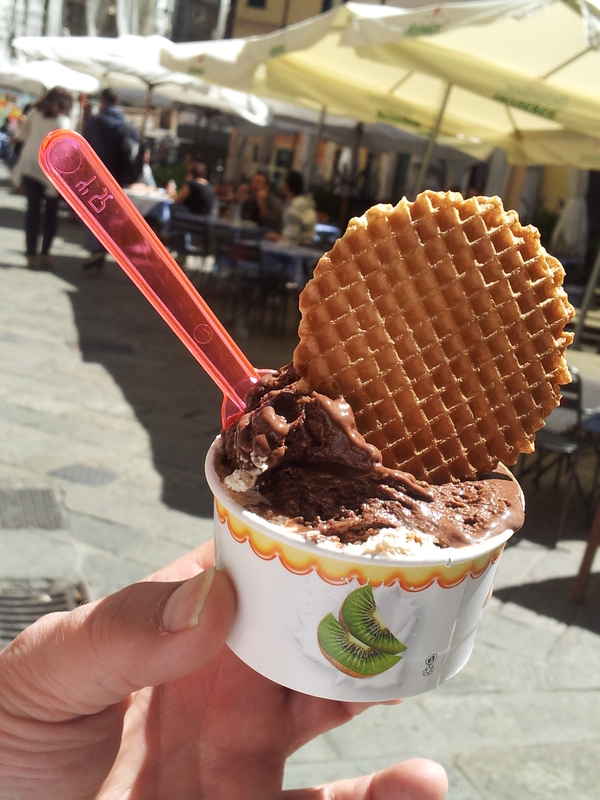 On my last visit I had two scoops of Pralinato and Cioccolato for €2. Heaven in a tub. I loved to fantasise about living around here but a teacher I met who had a top floor flat nearby says she can’t wait to move because of the noise of the people coming from the street below. I’d still swap with her in a moment. 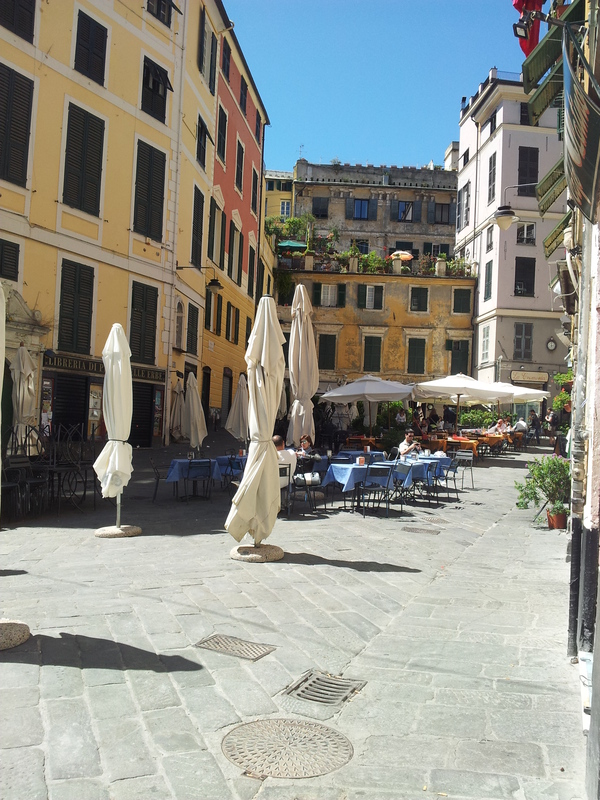 This entry was posted on October 1, 2013 at 6:22 pm and is filed under Genoa, Italy, Liguria, Piazza delle Erbe, San Bernardo with tags Bar Berto, La Cremeria delle Erbe, Panson, Piazza delle Erbe. You can follow any responses to this entry through the RSS 2.0 feed. You can leave a response, or trackback from your own site.